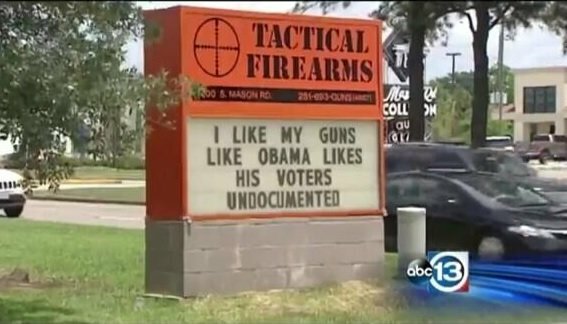 Brilliant➙ Sign at TX Firearms Company: "I Like My Guns Like Obama Likes His Undocumented Voters"
A gun store owner in Texas posted this sign recently. A Texas gun store has put up a new sign that is grabbing people’s attention. “I like my guns like Obama likes his voters: Undocumented,” the Tactical Firearms sign states. The store’s owner, Jeremy Alcede, says the sign is meant to be looked at as a joke. Katy residents support the store’s sign.